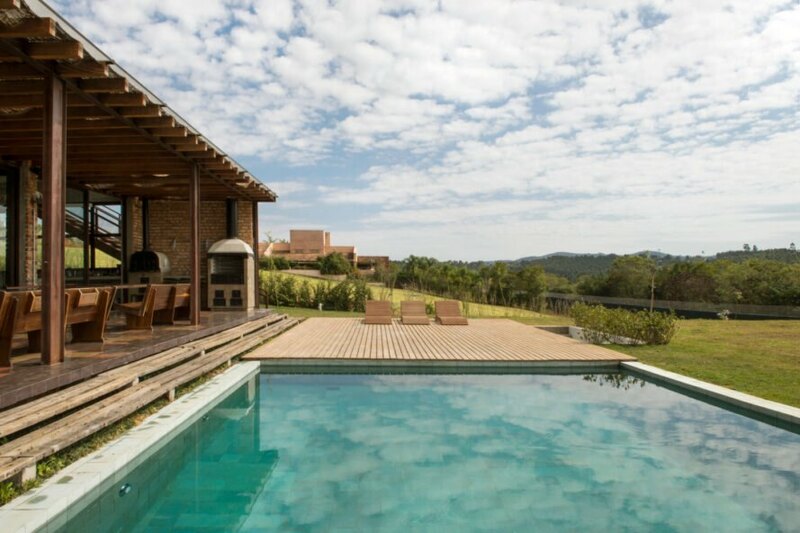 Brazilian firm Estúdio Penha has tucked a brick-clad home into the sloped landscapes of an expansive forest outside of São Paulo. 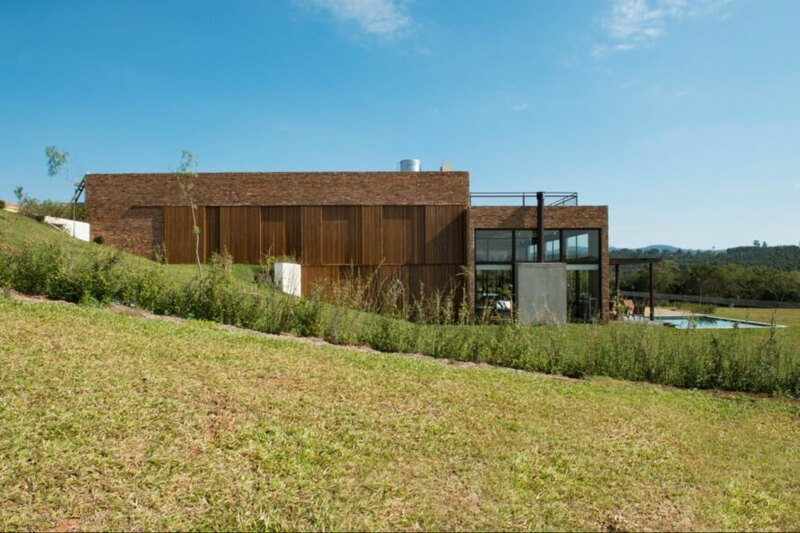 Partially embedded into a grassy hill, the gorgeous Quinta da Baroneza House blends quietly into its natural setting thanks to an expansive green roof and muted brick cladding that matches the same color of the local soil. 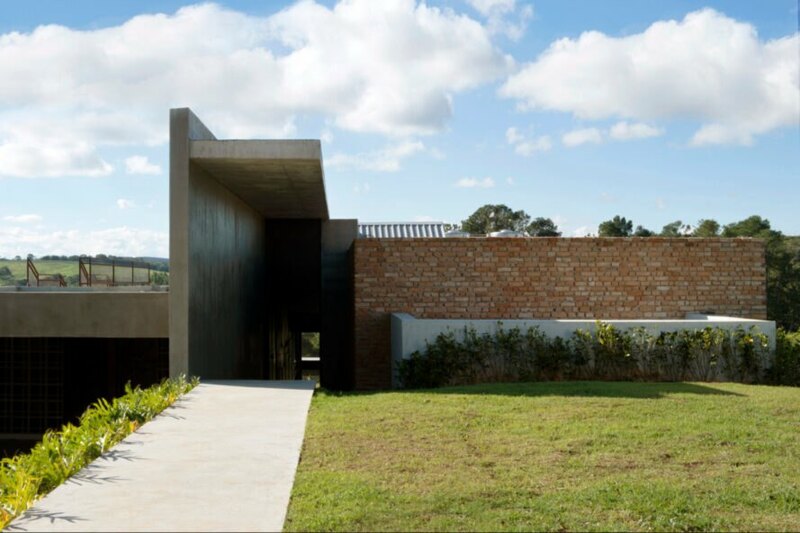 The brick home is comprised of three main volumes that are separated by a smooth, concrete, L-shaped wall. This large wall crosses through the main volumes, creating a corridor that traverses the length of the building to an inner courtyard that connects the interior with the exterior. Further enhancing this connection to the natural surroundings is a large metal staircase that leads up to an expansive green roof planted with native vegetation. Although underground, the living space in the first volume is illuminated with natural light thanks to a strategically placed skylight. 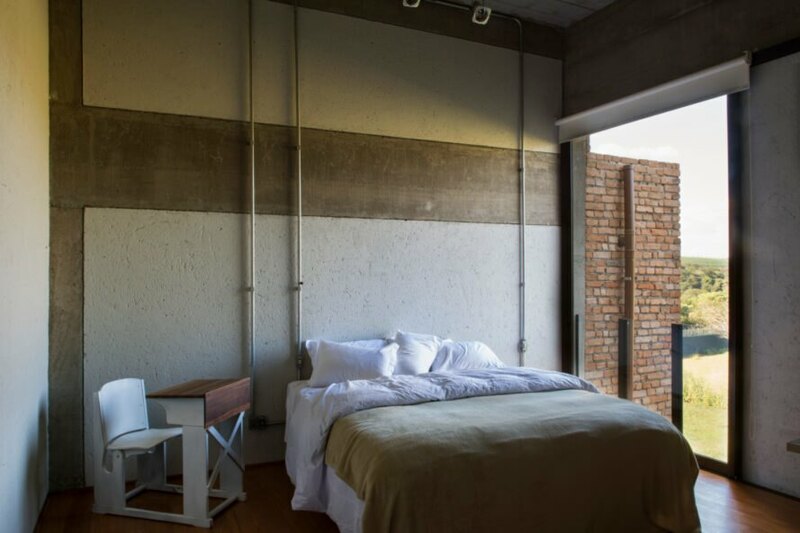 Much of the interior features walls with rough cast plaster finish, concrete touches and exposed plumbing and electrical wiring, all of which give the living space a cool, industrial aesthetic. 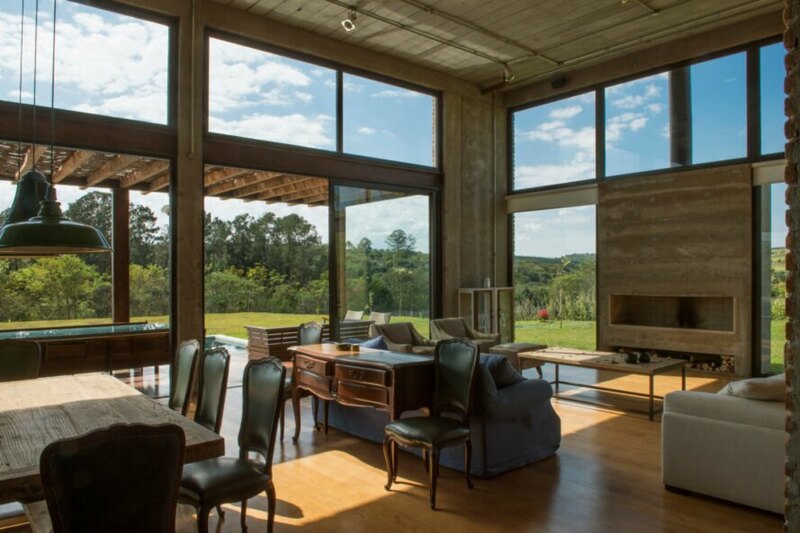 Flooring found throughout the home was made out of reforested wood. The largest area in the home is the main living room with a front facade comprised of massive sliding glass doors, which open out to the Hijau stone pool surrounded by a wooden deck. The pool was created with tiles in differing shades of green to create the sensation of being in a lake. Definitely the heart of the home, this area blends in nicely with the terrain with a rustic vine veranda that provides shade from the harsh summer sun. Estúdio Penha designed the Quinta da Baroneza House to meld into the landscape. 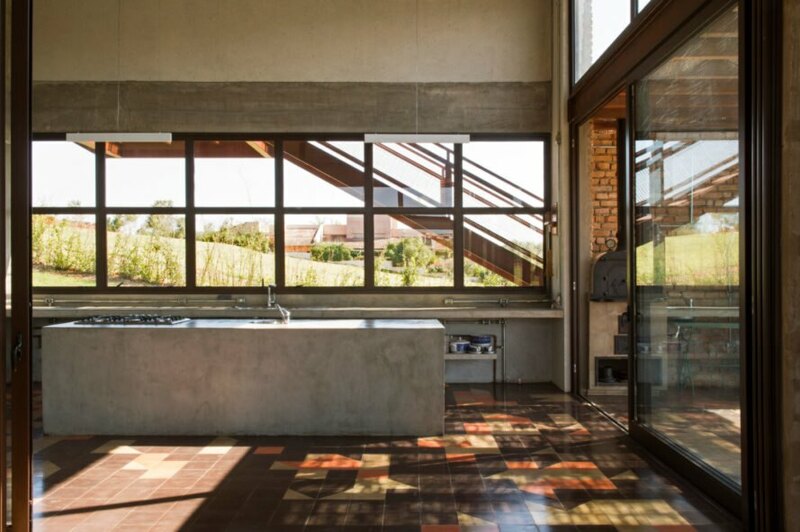 The beautiful home is clad in solid brick walls that are the same color as the local soil. 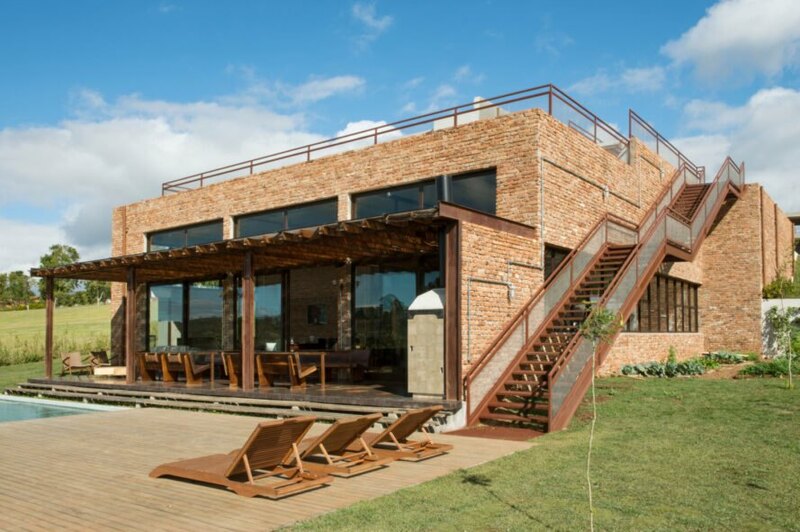 The home is built into a sloped landscape, with the lowest floor partially submerged underground. The main volume is cut by a large wall made out of cast plaster finish. The garage and lower level sit embedded into the landscape. The interior space is illuminated by an abundance of natural light. Industrial design finishes and neutral colors give the home a unique look. The bedrooms and bathrooms feature some industrial touches, such as exposed pipes. 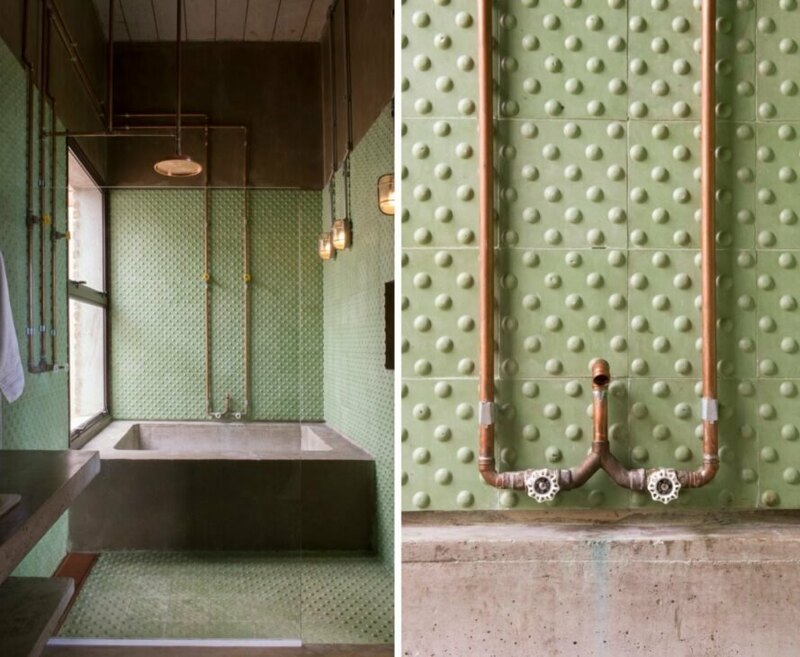 The retro bathrooms feature muted colors and exposed pipes. At the heart of the home is the large outdoor patio with a swimming pool. The tiles of the pool are in different shades of green to mimic the look of a natural lake. A large metal staircase leads to the green roof.